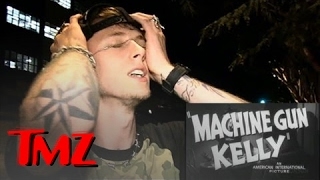 Machine Gun Kelly -- Spittin' Vodka... In A Chick's MOUTH! ‘Faking It’s’ Katie Stevens Gushes Over Tori Kelly & Talks Season 3! Amber Rose&Machine Gun Kelly -- READY, AIM, BANG! Machine Gun Kelly -- WASTED In West Hollywood! Machine Gun Kelly Teases New Album&Gives Music Industry Advice! Michael Rapaport star of "Atypical" on Netflix, started out as a stand-up comic and fell into acting! Michael challenged Justin Bieber to a one-on-one basketball game! He thinks Justin is a humble and nice person. But he has not been to a Bieber concert yet! He called out Eminem and other rappers like, Machine Gun Kelly and Tyler, The Creator. He feels hip hop is based on competition and doesn't feel like rappers today are keeping up. Season 2 of "Atypical" is here! He thinks the show has evolved but is still funny and resembles season 1.